Looking for 24 hour emergency Electrician? No obligation, FREE quotes, MBE offers professional and reliable services relating to all your electrical needs. 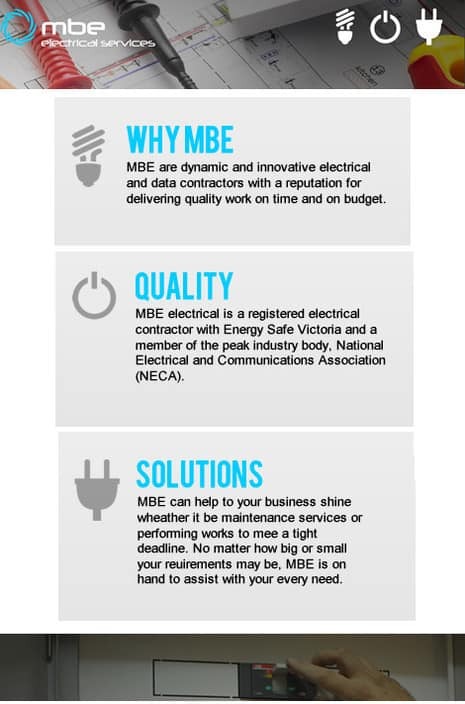 Here at MBE Electrical services is a privately owned company based in Bentleigh East, we have provided quality electrical services since 1999. With a strong & knowledgeable team of electrician, our clients can be confident that all our work is of very high standard and that we can provide a solution to all your electrical needs. MBE Electrical services provides a complete range of electrical services specializing in all types of commercial, residential & Industrial work from small to large jobs. We service all areas with a 24 hour emergency service if required. Call 0411 862 600 for a no obligation FREE quote today! Really happy with the service from Michael and Reese. Very thorough workmen, even cleaned up after themselves. Treated my house and my dog with respect. Even fixed a broken roof tile and an oven light at no extra charge. Will be using them again. one word...... Outstanding, One night I had huge problems with the electricity and the whole house was out of power. After many After-hour phone calls, MBE had the only electrician that was willing to come out at 9:00pm just to get the power Back on!! As a result I asked MBE to do some electrical work and when they did the level of service was like nothing I have had before. They are by far the cleanest and most professional and on time service that I have ever had! Thank you MBE for helping a Girl out when she was in a jam! By far the best Electrical Service I have ever had!!!! Where most of the electricians I had to price my job were outrageously expensive, MBE gave me the best value for money and I was very pleased with his service. I have never been treated so professionally by a trades person in my life. highly recommend and refer to any person looking for a electrician. Staff was good enough to come around to have a look at requirements but has since not responded to calls and I will now have to look elsewhere.